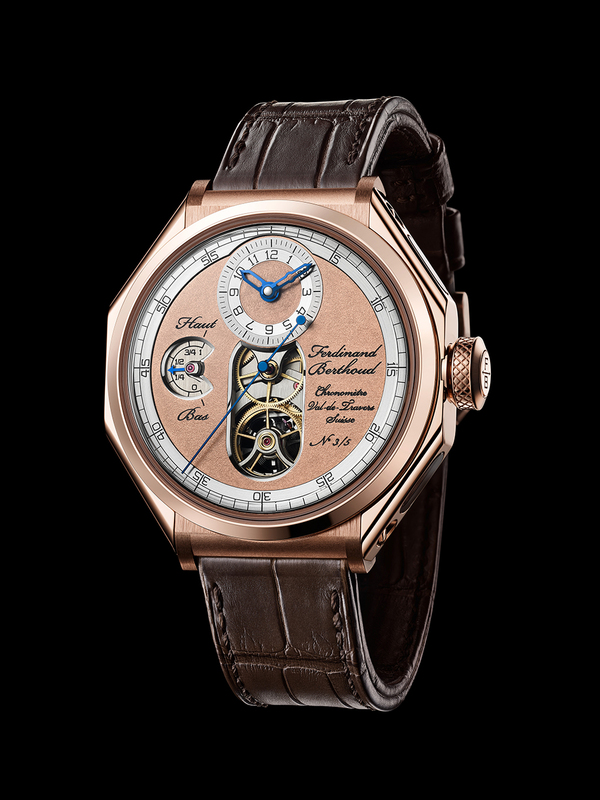 The Chronomètre FB 1 is the first creation from Chronométrie Ferdinand Berthoud. Entirely crafted within the Manufacture in Fleurier, it stems from many years of development. Its slant-edged case is inspired by the architecture of the marine chronometers designed by Ferdinand Berthoud from 1760 onwards. It was on December 13th of that year that he submitted to the French Académie des Sciences his Mémoire sur les principes de construction d’une Horloge de Marine. This description of the construction principles for a marine clock laid the foundations for Ferdinand Berthoud’s very first marine chronometer, which was completed the following year, in 1761. For more than 45 years, Ferdinand Berthoud perfected its movements so as to achieve the highest possible chronometric precision. The FB 1 collection of Chronométrie Ferdinand Berthoud pays tribute to this work and to the movements that pioneered chronometric precision. Its case is inspired by Ferdinand Berthoud’s marine chronometers, in particular their gimbal suspension that served to maintain on-board chronometers in a permanently horizontal position. The movement is placed in the centre of a watertight container and has a characteristic pillar-type structure. This technique of affixing bridges to the mainplate was no longer in use until this new revival. It lightens the structure of the movement and at the same time enables a very open view of its details and finishes. This 100% in-house movement has three distinctive features. First of all, the movement comprises an original suspended fusee-and-chain transmission system. The latter serves to deliver constant force to the escapement throughout the running time of the movement, from its first turn of the crown through to complete winding, thereby serving to achieve 53 hours of power reserve. 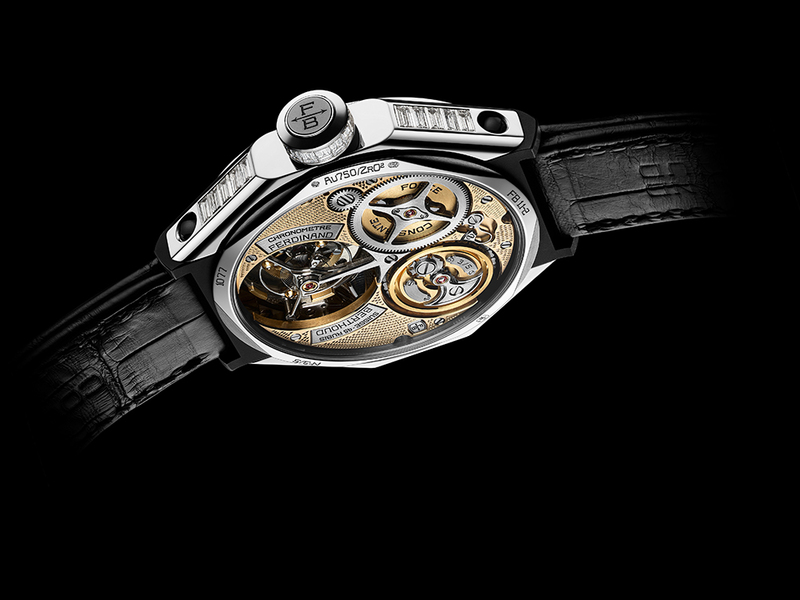 Secondly, the calibre is equipped with a direct-drive seconds tourbillon. 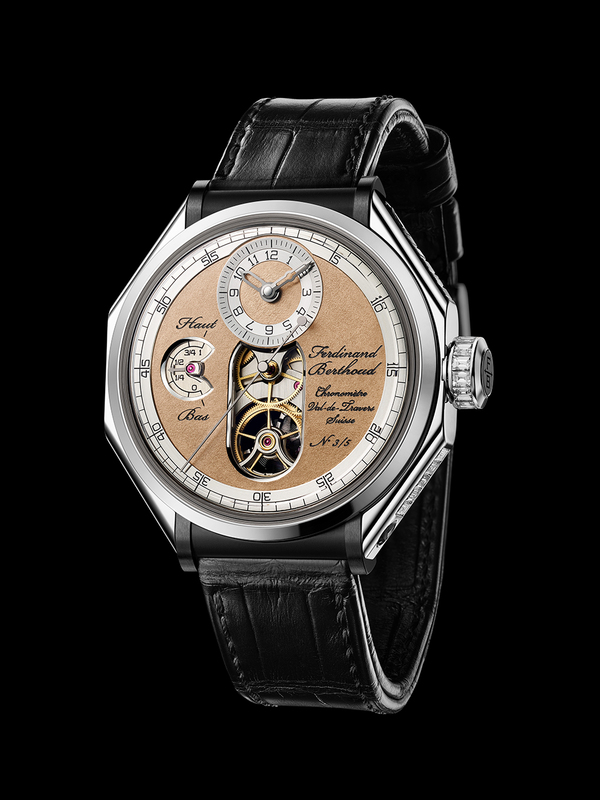 The tourbillon itself makes it possible to compensate for the variations in movement induced by the different positions to which a wristwatch will have to adapt, several dozen times a day. This direct-drive seconds display is made possible by the correlation between the fourth wheel and the wheel driving the tourbillon carriage, both perfectly identical and visible on the dial side. Finally, the FB-T.FC calibre is equipped with a power-reserve indicator operating in an atypical manner. It rests on a mobile cone which, in association with the rotation of the cylinder, moves up and down according to the state of wind. A jewel-tipped mobile arm (feeler spindle), takes an extremely accurate measurement, which it then transmits to a visible hand on the dial side. The accuracy of each movement is attested by a chronometry certificate issued by the Official Swiss Chronometer Testing Institute (COSC). Four patents have been filed for the unique features of the Ferdinand Berthoud movement.